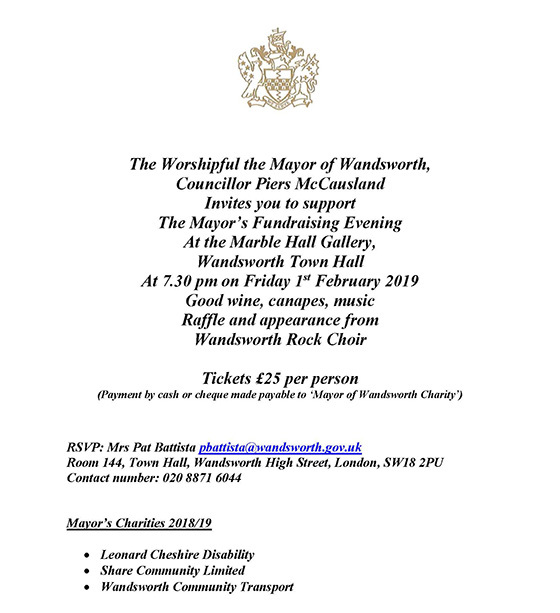 The Worshipful the Mayor of Wandsworth, Councillor Piers McCausland is holding a fundraising evening reception for his chosen charities, one of which is Share Community. We are very honoured to have been chosen as one of the Mayor's charities for support during Cllr McCausland's mayoral year, and we're grateful to him and his team for putting in time, care and effort to organise what promises to be a super evening. Please do come along and show your support. The reception on 1st February 2019, from 7.30pm to 9.30pm with drinks and canapés, will take place in the Marble Hall at Wandsworth Town Hall. Tickets are £25. Please contact the Mayor's Secretary, Pat Battista, to reserve a place. You can send your cheque made out to Mayor of Wandsworth Charity to guarantee your place.